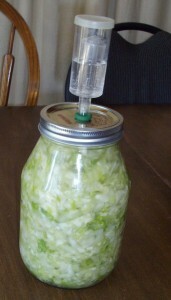 Traditional food preservation methods included lacto-fermentation. Cheese is a lacto-fermented food, as is yogourt. 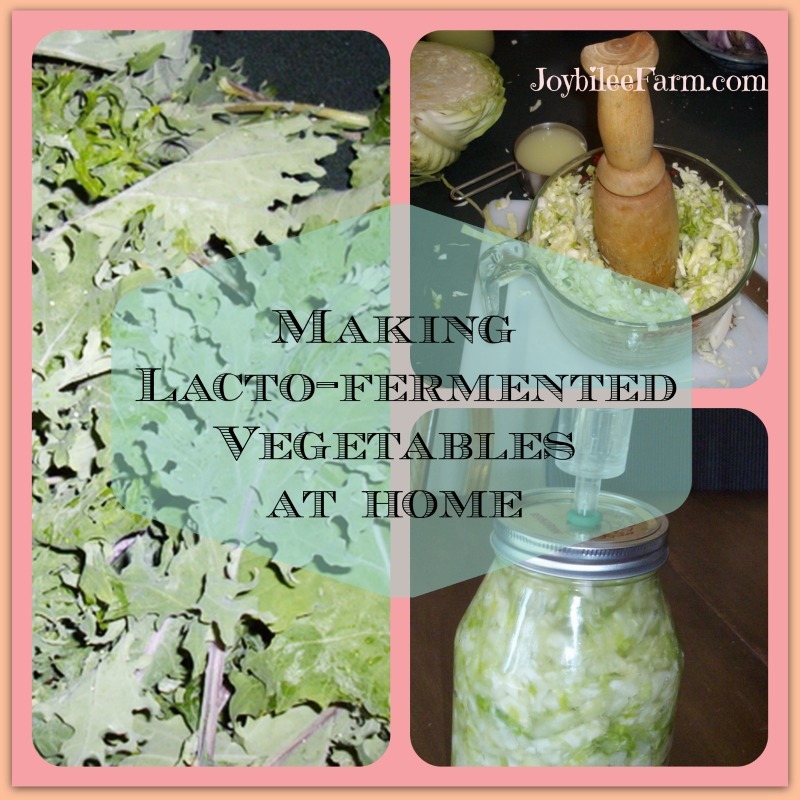 Vegetables can also be lacto-fermented. Fermentation preserves vegetables by converting water, starches, sugars and proteins, with micro-organisms, preventing spoilage and increasing the nutritive properties. Increased probiotics like lactase and lactic acid, and other immune chemicals that fight off harmful bacteria and even cancer cells. How do you make lacto-fermented vegetables? Traditional lacto fermented vegetables like Kimchi, Sauerkraut, Miso, and pickles are made by washing vegetables, chopping, salting (brining) and placing in a crock. The salt inhibits harmful bacterial growth while encouraging lacto-bacteria. You can increase the lacto-bacteria by inoculating your culture with whey — much in the same way that bread is inoculated with yeast to encourage the right kind of fermentation. Vegetables are weighted under the juice to allow for anaerobic fermentation. If vegetables rise above the liquid, mould can develop, harmful bacteria can enter the product and spoil the food. One way to prevent mould and other harmful bacteria from entering during fermentation, is to use an air lock. Fermentation crocks are available with built in airlocks. An investment to consider if you love this food preservation method and plan to do it for years. Food can be fermented and then stored in the crock at room temperature. I don’t have a fermentation crock. I prefer to ferment in canning jars, which I have in abundance. By fermenting my sauerkraut in canning jars, they are ready for storage as soon as fermentation stops. You can ferment your vegetables in canning jars with two piece lids, however, there is a chance of spoilage as contaminated air enters the jar. Using an airlock prevents contaminated air from spoiling the jar contents. You will need a two piece wide-mouth canning jar lid – with ring and snap lid. 2 rubber castration bands (used for docking lamb’s tails or castration) Sold on Amazon or at a livestock feed store. These act as a seal on either side of the hole. Wide mouth canning jars for lids. Make one airlock for each jar that you are going to ferment in. Drill a hole into the centre of the snap lid by placing lid on scrap piece of wood and drilling through the lid into the wood. Smooth out any rough edges. Place one castration band on the air lock. Poke airlock through the drilled hole in the snap lid. 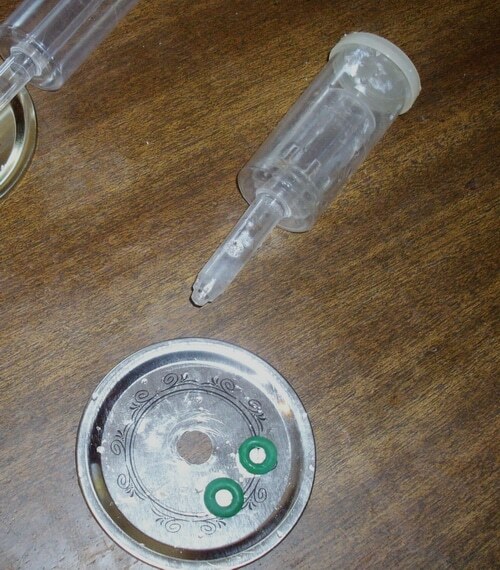 Secure 2nd castration band on the inside part of the airlock, making a tight seal between the two bands, on the snap lid. To use the airlock, place boiled and cooled water in the airlock, Attach ring and screw lightly onto filled jars. Once you have a couple of wide-mouth jars fitted with airlock lids, you are ready to make sauerkraut. 2 – 2 litre wide-mouth canning jars or 4 – 1 litre canning jars. You will need an airlock lid for each canning jar. To chop the cabbage finely, I just used a chef’s knife, but you can use a mandolin, which saves a bit of time. 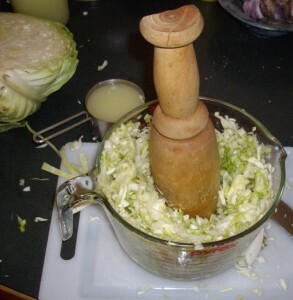 I chopped up the cabbage and put 1/4 of it in a large bowl and crushed it lightly with a wooden mallet. Added 1 tbsp. of salt and another 1/4 of the sliced cabbage. Pounded again. Added 1 tbsp. of salt. Pounded again. Pounding will mix the salt with the cabbage and release some juice. I put this into a 2 quart mason jar and topped up the jar to within 1 inch of the top with whey left over from cheese making. You can use boiled and cooled water if you don’t have whey. Place the washed and sanitized airlock lid on the canning jar, ensuring that the spout on the air lock is clear of the liquid in the jar. Place the jar somewhere that the temperature is between 65F and 75F consistently. I have mine on the kitchen counter. If your home is warmer, you may want to put the fermenting jars in a cooler basement room. One cabbage will fill 2 – 2 quart jars or 8 pint jars (500ml). After fermentation, you can can this in a boiling water bath, but that will pasteurize the lacto-bacteria. Traditionally fermented vegetables were stored in a crock in the root cellar and served up as needed. If you make small batches, you can store the unprocessed jars in the fridge or in a root cellar and use as needed without ever having to heat up a canner. Allow to ferment for 4 days if you used whey, a week to 10 days if you used water. The contents will bubble and the float in the airlock will demonstrate that gases are coming out of the jar. The time varies according to temperature. After a while the fermentation will cease and the vegetables are ready. Remove the airlock and replace with sterilized 2 part canning lid. You can store this in your fridge now, or in a cold storage room. These continue to improve over time. If you are concerned about spoilage you can water bath canthem, as you would jam. If you do this you will remove the healthful probiotics and stop the fermentation. The choice is yours. Traditionally, sauerkraut was kept in the keg, in a cool storage area, and served out as needed, while a weight kept the vegetables below the surface liquid. The taste of naturally fermented vegetables is free of acidic sharpness, like vinegar pickles. And natural sea salt doesn’t cause heart problems like iodized salt. Serve as a condiment, or a side dish. Yesterday we had friends over for dinner and talked about Mennonite sauerkraut. My friends both had mothers that made sauerkraut in a crock every fall. One mother used plain cabbage and salt, the other mother added onions, carrots and oregano to her kraut. Interesting what you can preserve by fermentation. Both stored their finished vegetables in the fermenting crock and scooped it out of the crock to serve. Our conversation turned to Bratwurst and sauerkraut and a trip to Germany. Amazing how food associations remind us of happy memories. My mother told me once, when she was first married, and I was a baby, we lived in the rented basement apartment of a home in Kitchener, Ontario. The lady of the house, Mrs. Heinz, was a quiet Mennonite woman. One September, my mother hadn’t seen Mr. Heinz for a few weeks, when she noticed a very strong, smell coming from the other side of the basement. My mother became irrationally nervous. She was relieved when Mr. Heinz returned from his business trip and Mrs. Heinz offered my mom a jar of fresh Sauerkraut. Update (Aug. 31): The fermentation lock worked perfectly. The juice from the fermenting cabbage occasionally overflowed and entered the lock. I simply wiped it down and dumped the liquid in the lock, replacing it with fresh water. It was ready in 4 days. Taste was very nice. My husband says that it takes a bit of getting used to. My next experiment will be to add some garlic and oregano to the cabbage. Do you have an interesting sauerkraut story to share? Have you tried making traditional, lacto-fermented vegetables. What’s your favourite kind? Leave a comment. Grab my free E-book to get more help on beginning your journey to food security and homestead abundance. My grandfather’s recipe for fermented cucumbers included a piece of rye bread on the top of the water in a crock covered with a tied-on dish towel which was removed after 3 days. What would have been the purpose of the rye bread? The yeast? I have made these and they are so good! Probably the lacto fermented bacteria. Rye has naturally occuring lacto bacteria.